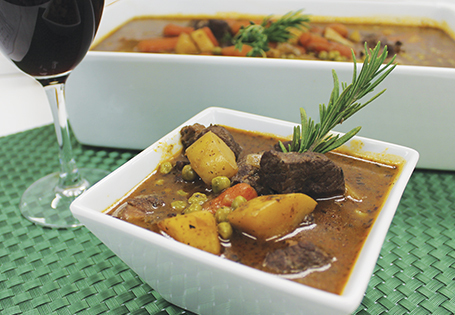 A hearty dish to add to your holiday recipe collection. In a food processor, grind 1 ½ teaspoons salt, 1 tablespoon black pepper, 1 tablespoon Italian seasoning, 2 bay leaves, garlic cloves and olive oil. Cut lamb into 1-inch cubes. In a large bowl, combine spice mixture and lamb, stir until well-coated. Cover and marinate for 30 minutes. In a Dutch oven, heat vegetable oil over medium-high heat. Sauté lamb until brown, about 5 minutes. Remove lamb, reserve. Reduce heat to medium-low. Add carrots, onions and potatoes. Sauté until softened, about 8 minutes. Stir in tomato paste and cook for 30 seconds. Add flour, continue cooking for 2 minutes, stirring occasionally. Pour wine into pan and scrape bottom of pan to remove brown bits. Bring to a boil, reduce to simmer, continue cooking until liquid is reduced by half. Add beef broth, ½ teaspoon salt, 1 teaspoon black pepper, 2 teaspoons Italian seasoning and 2 bay leaves; bring to a simmer. Return lamb to pan, cover and continue cooking for 1 ½ hours. Add peas for the last 20 minutes. Season to taste with salt and pepper. Remove bay leaves before serving.